Portable wheelchair lifts are an ideal solution for the home user who needs to be able to clear various height obstructions, but may not need to frequently access all of those areas. For example, rural estates often have exterior buildings such as barns, pump houses, storage units, or carports. Rather than building separate lifts for each such structure, a single portable wheelchair or scooter lift can be moved from location to location as needed. Portable wheel chair lifts have weight capacities roughly equivalent to other residential lift models (550 to 600 lbs. ), and generally range in height from 4 to 5 feet. They require some assembly. Such lifts typically operate on an electric worm-gear drive, though some available models operate via hand crank. Portable lifts only have two stop points. Electric models usually offer the option of buying a backup battery to ensure operation in the event of a power loss. 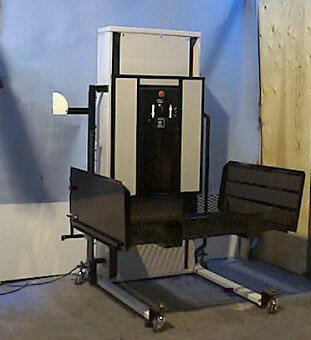 Portable lifts also include built-in lower- and upper-access manual folding ramps. Due to the basic nature of such lift systems, manufacturers don't offer extra options such as call-send controls or alarm buttons on these devices, and they are often straight-through access only, with no alternate platform configurations available. Manual portable lifts are the utmost in streamlined technology, made of lightweight aluminum to maximize portability and allowing minimal amounts of manual force to lift the user. Some manual lifts can manage up to 300 pounds of weight with less than 12 pounds of force on the crank mechanism. They are usually built with an adjacent-access platform configuration, to allow for versatility in transporting a wheelchair user through a variety of entryways. Lower-access ramps on manual platform lifts are usually a fixed-length folding platform, but manufacturers often allow the user to choose which size upper-access bridge they want; you can even purchase several bridges of different sizes to accommodate larger gaps between the lift and entryway if extra clearance is needed.